Following the politically-driven riots in 2006, where looting and destruction of property was largely blamed on wayward youth, the nation of Tonga began to critically examine the emergent issue of youth unemployment and under-employment. The Tonga National Youth Congress and Tonga’s Ministry of Internal Affairs Division of Training, Employment, Youth, and Sports, along with several transnational non-governmental organizations and foreign government aid organizations, rolled out a variety of programs aimed at developing youth skills and offering pathways to employment. However, with about 60% of the population under the age of 25 (Tonga Census 2011), the numbers of youth seeking employment still outnumber available jobs, particularly on outer islands where fewer wage-earning opportunities exist. Thus, many youth and their families consider immigration to find work. Income from a temporary job overseas can sometimes exceed an entire year’s salary in Tonga. This economic incentive, coupled with a deeply engrained sense of moral responsibility to help one’s family and the prospect of an exciting adventure in the company of friends, leads many youth into circular migration—a pattern of movement that has become emblematic of life in parts of Tonga. 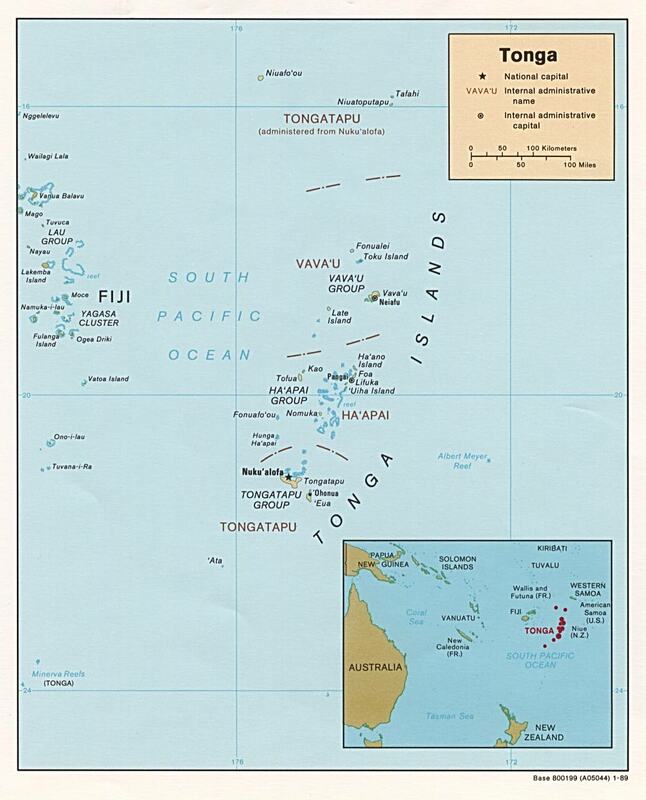 The nation of Tonga is a chain of small yet widely dispersed islands in the Pacific Ocean. Some estimates of Tongan immigrants and people of Tongan heritage living outside of the country exceed the country’s population of roughly 110,000. On the island of ‘Eua, where I conduct fieldwork, people of all ages appear to be in near-constant movement within and beyond the nation’s boundaries. School-age children go to live with relatives on another of the country’s islands to attend school. Students in primary and secondary grades move further afield, traveling for school holidays or, for those with the means, completing a few years of school abroad to improve their English skills or take coursework unavailable at home. Older youth go back and forth between various islands in Tonga to fulfill family obligations or for temporary work. Some young people eventually attend university in Fiji, New Zealand, Australia, China, or Japan. Out-of-school youth leave Tonga occasionally for marriages or medical procedures, but the majority of youth travel overseas from ‘Eua for temporary work. 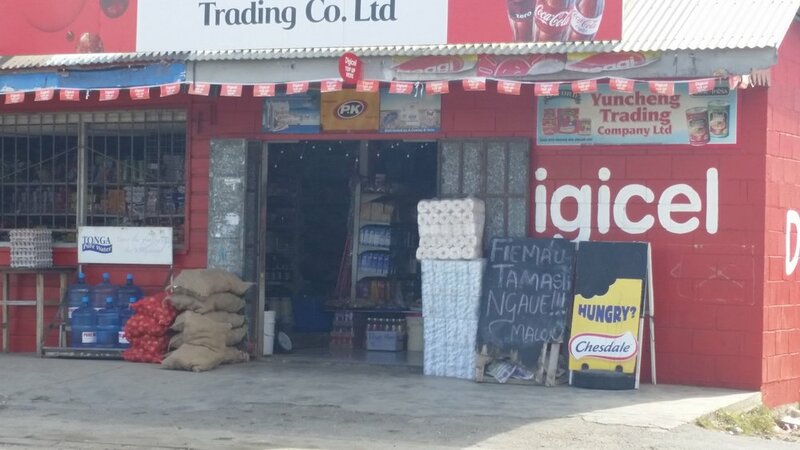 A small shop in the Tongan capital city of Nuku‘alofa with a “help wanted” sign sitting out front. Jobs like the one advertised here for a “shop boy” are often low-paying, further motivating youth to consider circular migration for employment. Photo credits: Author. Talking to Tongan youth from ‘Eua about their experiences of moving between islands and nation introduces a more nuanced picture of youth circulation in the Pacific. Young people’s stories highlight the unique place youth occupy within Tongan social organization as they balance the relatively carefree dependency of childhood and the responsibilities of adulthood. The choice to work overseas signals an acknowledgement of the traditional moral obligation to help support one’s extended family. After dropping out of high school and helping around the house for a few years, Maile first went to Australia in her early twenties as part of a group that went through the process of acquiring seasonal work visas, traveling overseas, and then working together in the same region to harvest fruit. As several research participants described to me, a relative overseas working for a farm or factory sponsors a group of family and close friends from their “home” village in Tonga for contract work ranging from six weeks to six months. These arrangements through social networks offer assurances of secure employment both in the present and for the future. 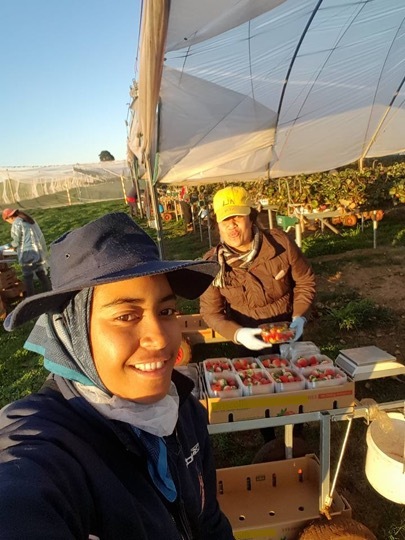 Two youth pose for a selfie while working on a strawberry farm overseas. Photo credits: M. Takai. In conversation with her parents, Maile decided to work overseas. Reflecting her growing responsibility and sense of agency within her family, she recalled, “I was happy to work…I’m not married yet, my parents are still alive, and I can help out our household…there wasn’t anyone in our family who could work, everyone was just staying at home...I’m happy to just go and work, to help my parents.” Maile’s father and siblings sustained their family through subsistence work on their farm and fishing, supplemented by occasional remittances from relatives abroad. Without the commitments and responsibilities of marriage and children, Maile wanted to help her family by providing the monetary resources that have become increasingly necessary to life on ‘Eua. Her account also reveals how youth participate in the “distributed agency” of the family in Tonga when it comes to migration and other major life events (Small 2011). Youth are able to make intentional, goal-directed decisions to migrate for work, but they do so with the advice of, and for the ultimate benefit of, their entire family network. Youth on ‘Eua now represent an ideal category for waged work because of their relative flexibility and freedom from ties of childcare, religious duties, producing traditional exchange materials, or other locally-based obligations. However, working in formal waged employment, particularly that which demands circular migration, removes them from contexts for socialization into more traditional cultural roles and responsibilities. This creates a globally-inflected paradox: youth take on market-sector jobs in order to uphold cultural obligations to help extended family, yet in so doing, their ability to maintain and reproduce traditional cultural values may be compromised. Tongan youth on a Sunday outing pose in front of the Maori memorial obelisk at One Tree Hill (Maungakiekie) in Auckland, New Zealand. Photo credits: Author. Alongside the monotony and physical demands of employment, many young men and women recalled the out-of-the-ordinary enjoyment of meeting new people from all over the world and exchanging ideas with friends from very different cultural backgrounds. Seeing the size and scale of cities overseas, the range of architectural styles of buildings, and new plants made even shuttling to work sites seem exciting. As enthusiastic Facebook users, many ‘Euan youth post photos of their trips to local landmarks on days off or casual scenes of daily life, such as the lines to weigh their containers of harvested fruit, or meals and prayer groups among workmates. Like their friends still at home, Tongan youth working overseas balance between a strong desire to help their families and make their parents proud on the one hand, and curiosity-driven wishes to experience all the intriguing novelty that a new place provides on the other. According to Lee (2003), Tongan youth who grow up overseas or live there for longer periods of time can confront issues such as racism and poverty. A lack of visibility and resulting lack of access to social services has also emerged as a significant challenge to Tongan and Pacific Islander immigrants in some areas. While the youth with whom I spoke recounted experiences overseas that were not always easy or pleasant, few experienced exploitation in ways that plague other migrant labor. Traveling in groups with other Tongans and, in some cases, having relatives living abroad with whom to stay, acted as a safety net to mitigate hardships and allowed youth to fulfill their responsibilities to contribute to family resources while experiencing other ways of life. All names used here are pseudonyms. Reported speech was translated into English from the original Tongan by the author. Dr. Mary K. Good is Assistant Professor of Cultural Anthropology at Wake Forest University. Her research focuses on youth, global modernity, and morality in Tonga, with a special interest in how young people navigate moral frameworks in their use of digital media. Research presented here draws from her current ethnographic project on experiences of school-to-work transitions, unemployment, and entrepreneurship among Tongan youth.